Sumba is one of the poorest provinces in Indonesia. Activities of government programs and international assistance change the traditional structure continuously. Corrugated iron instead of Alang roofs and tombs of concrete instead of stone seem desirable. But a lot still remains as it was. Sumba horses and water buffaloes are still essential for agriculture. Festivals and traditions are still deeply rooted in the Sumba community. The following remarks are only a small survey of what Sumba really is. Further reading can be found under the link section. There are now 2 prehistoric relicts in Sumba: In Melolo was found a skeleton of an exceptionally large man and a large clay jug. The items can be seen today in Jakarta. At the finding place near the police station of Melolo is a plaque on it. In Lambanapu on the outskirts of Waingapu were found 5 skeletons and various clay jugs in 2017. Both finds date from the Palaeolithic period between 2800-3500 years ago. The knowledge of the early history of Sumba is based on stories that were passed down from generation to generation. Only from the 15th century are occasional written records. According to tradition, the name of Sumba derives from Humba. Rambu or misses Humba was the wife of Umbu or mister Walu Mandoku one of the chiefs among the first tribes who settled in Sumba. He wanted to perpetuate the name of his beloved wife, by naming the island so. They came with ships, landed at the northern tip Tanjung Sasar and founded the village Wunga. The name Humba was applied up do the colonial era. The Dutch named it in their language Soemba. According to the local religion Marapu, the first human beings came not with ships but via a ladder from heaven to the northern tip Tanjung Sasar and founded the village Wunga. Anyway, Sumba had always been an isolated island. It was inhabited by several small ethno linguistic groups. Sumba had its own civilization. There were small clans or kingdoms with their own customs, own social structures and ceremonies during the cycle of life such as birth, marriage and death. In the fourteenth century, Sumba was part of the Javanese Majapahit dynasty. After this dynasty had collapsed, Sumba came under the rule of Bima in Sumbawa and later Gowa in Sulawesi. These political changes had little impact on daily life in Sumba. Life was more influenced by internal wars between clans and small kingdoms concerning land and trading rights. In these clan wars warriors brought the heads of the killed enemies to their villages and speared them up on so-called skull-trees (Andung) in the middle of the village. They believed that the heads would bring a good harvest and wealth for the village. There were also kidnapping and slavery between villages. Sometimes slaves were sold to neighbouring islands. Because of these wars and attacks, villages were built on hills or mountains and surrounded by stone walls for protection. Despite their hostility, they were economically dependent on each other: the inland villagers grew wood, betel nut, rice, and fruit, while coastal residents made Ikat, wove textiles, produced salt, and operated fishing and trading with other islands. Islands around Sumba regarded Sumba as a very violent island. Today you can still see skull-trees and sculls near the Rumah Adat in some villages. Today it still happens that Sumbanese burn houses or villages of other ethnic clans or tribes. Within the last years at least 3 traditional Marapu villages have been partly destroyed that way. I heard the story that recently someone cut out someone's liver in order to cut out his soul (which is located there) and ate it. In 1522 the first ships of the Portuguese people came here. The Netherlands, later the colonialists of Indonesia, initially gave little attention to Sumba because they saw no significant commercial interests in Sumba. Also the large number of small kingdoms made it hard to install a significant impact. The Netherlands did not discover the value of sandalwood until the 18th century, but then started interfering in Sumba. In 1756 a treaty was made between the Dutch United East India Company (VOC) and some of the Sumbanese nobles. Sandalwood was cut to a considerable extent and exported. Sumba was known as Sandalwood Island. This created vast, arid grasslands or savannas. From 1866 Sumba or in Dutch language Soemba belonged formal legally to the Dutch East Indies. In 1906 Dutch troops invaded Sumba because clan wars disturbed the colonial trade. In 1913 the Netherlands set up a loose civil administration in Sumba. However this changed the social structures of Sumba only very slowly. Actions of the Dutch to gain more power and influence, ended often in bloody conflicts. During the Second World War Sumba was occupied by the Japanese from 1942 to 1945. The Japanese intended to use Sumba as a starting point for an invasion of Australia. Australia is not far away – in direct line is 700 km ocean in between. In East Sumba around Melolo remnants of the Japanese facilities can be seen, such as bunkers, an airfield (now football field), and the former command center in the colonial style (now conference center of the evangelical church). The Sumbanese say that the rule of the Japanese was more brutal than the Dutch. The Japanese left Sumba as the Australians landed in Kalala at the south of the island. The news of Sukarno having declared independence in 1945 took 6 months to reach Sumba. Exactly 5 years later on 17 August 1950 Indonesia took over Sumba as well as other islands in east Indonesia. Sumba got part of the province of Nusa Tenggara Timur. The Indonesian government left the structures and family clan connections of the old Sumba as they have been, so that the powerful families in the past are still the rich and powerful today. The long-time ruling clans could continue to exert their power. In this context there was an outbreak of riots and killings in Waikabubak in 1998. Due to the isolated location of the island and the limited economic resources in Sumba, the language, religion, and traditional culture have been preserved - at least in the countryside. The daily life of the population is basically a mirror image of their traditional religious life. Thus traditional religion is more likely to be found in traditional villages. Someone who turns to another religion is also rather someone who turns his back to the village. How strong the tradition is, can be seen especially on still relatively large proportion of people in traditional dress in everyday life. The proportion in West Sumba is greater than in the east. At festivals or in church, people like to be traditional dressed, even if they normally wear jeans. The men wear a short sarong (Hinggi) around their hips, and a belt with a sword (and mobile phone). Around their head they have a woven or Ikat band or turban with figurative motifs. In East Sumba, the headband is black with colourful motives and in West Sumba it is usually blue. The women wear long sarongs and also a headband, but with different motives. Women let their hair grow long and wrap it around their head. After the birth of her first child, a woman may tattoo her arms or legs as a status symbol. In the past it was customary to grind the teeth. In Sumba a family has to be understood like a clan (Kabisu). This includes people who we would name distant relatives. These in turn are subdivided into blood relatives and relatives in law. One has automatically rights within the family; the other must first be legalized emotional. Responsibility for all within the family is a great social good. The definition of property or belongings is often different from ours: For example, the money earned by a job in Bali is perceived as the property of the family. My house is not necessarily mine, but that of the family. My child does not necessarily have to be the genetic child. If the husband cannot make a child, the family may find another man to help in this case. And conversely, if there are no male heirs, the widow's water buffalo can become my water buffalo - and then that is not theft! And finally, my hired motorcycle will of course be that of the family I am living with - and it is often used. Every wedding means a change of the constellation within the family or establishing new relations to another clan. There are a variety of family policy issues. Most Sumbanese live in the village or area where they were born. Women often live in the village of their husbands. Sumbanese traditionally build their houses and villages on hills or mountains. They build so to be protected from enemies and to be closer to the spirits and ancestors. They surround their villages with a stone wall with 2 gates: the entrance and exit. In the middle of a village is a yard with tombs and sacrificial altars (Kateda). The houses with their (mostly) high, pointed Marapu roofs form a circle around it or are arranged in 2 parallel rows. Generally people of one village belong to one clan. If the clan is too big, villages can be divided and be built in different places. There are cases, where 2 clans share one village. You can recognize this by double names. The living areas of clans within such a village are divided clearly. For every clan there is a clan house = Rumah Adat. These are houses where ancestral spirits dwell and cult objects of the clan are kept. These houses are usually in the middle of the village. They are built differently from houses of the living people. They are a symbol of the presence of god's or Marapu in the village and may only be entered with the permission of the clan. Traditional houses are constructed with a wooden structure. The lower columns are surrounded with rings made from wood or stone, they symbolize "Lingga" and "Yoni", the sexual aspect of life, and serve as a symbol of fertility. But maybe it is only against parasites. The columns represent the cardinal directions. The fireplace in the middle is the symbol of the sun. The traditional roofs are normally made of Alang grass, in some coastal areas, also from the fan-shaped leaves of Lontar palm trees. But corrugated tin is found more often now, especially in open terrain and areas with strong wind. Traditional roofs do not last much longer than 5 years. In some tourist areas, local authorities subsidize the use of traditional building materials. Not all houses have pointed roofs, as they can be seen in brochures of Sumba. This is not really necessary. Probably the costs are more important today than the tradition. The origin of the inhabitants plays also a role. For example, the homes of immigrants on the coasts generally have no pointed roofs. Here you will find the typical architecture of the Bugis with bold colours. Or houses of the Savunese whose houses symbolize upturned boats with bow and stern cabin. The high pointed roofs also have a physical benefit, through the chimney effect they cool well. Even cooking fumes are sucked through like with a fan. But they are endangered by lightning or careless handling at cooking. Often houses or whole villages get destroyed by fire (Kadengar 2009, Ratenggaro 2012, Sodan 2016, Tarung 2017). Whatever the shape of the roof is, the fear of lightning is great. Often old motorcycle tires can be seen on the roofs - this is said to protect against lightning. The walls and floors are made of plaited bamboo. Often patterns are woven into the walls. In East Sumba, there are also house walls made from buffalo skin. Newer houses have walls made from wooden boards, these walls are often painted. A traditional house has 3 levels. Each of them is a symbol: the underworld below the house (Uma Dalu) - where the animals live - the human world - where the living live (Baga) - and the spiritual world - where the gods and ancestors live, and also cult objects, and supplies are stored (Labu Baga). The storeys represent the harmonious relationship between man and God, according to Marapu belief. Therefore, the traditional house is not just housing, but also a kind of social and ceremonial unit. Also the construction of a house is accompanied by rituals. For topping-out ceremonies animal sacrifices are made and the Marapu are asked whether everything is ok. For that the liver of a sacrificed animal is cut out and examined by the Rato, the spiritual leader of the community. All men of the village help with the construction of a house. To each village, in the village itself or in the vicinity you will find the typical Sumba Megalithic graves. Depending on the importance of the family, the individual graves have different dimensions and designs. More about it is in this section Tarik Batu. The villages are usually very simple. The prosperity of a village is not measured by its houses and their equipment, but by the number of water buffaloes, horses, cows, pigs, and more recently of motorcycles. With an increasing population and thus increasing village size there is often not enough space on the hills for everyone. Influences of our modern world show that it makes sense to live where the fields are or near the road. So there are fewer and fewer traditional villages. There are villages, which are partly on the mountain and partly in the plane. There are also villages where only the Rumah Adat stands on the mountain, but the residents have moved completely to the plane. And there are the "New villages" built by the government, and in less productive areas separately located homesteads. The village as a centre of life also loses importance due to another aspect: there is the pull of the city and trade with our western things that you have not in your village. People find work outside the village. Children finish elementary education school and then go to high school in town. Some already work in Bali or Malaysia and bring money back home. A rapid change in values is on the way. In the past, Sumba had a social system consisting of nobles, peasants, and slaves (Maramba, Kabthu, and Ata). This system continues to exist by name only, but has no function any longer within the Indonesian society. However, families who came from the nobility still tend to be rich. People who work for these families often refer to themselves as bondmen. One who has done well in the new society can keep his title. Due to the fact that there was no land reform in Sumba, the nobility still owns a large part of the country. The nobility can determine who may buy land and who may not. In recent times, thus the planned establishing of a resort in Mambang by foreign investors was prevented. However most of the people sell. That makes this segment of the population richer and enlarges the social divergence. In the past there had been cases in which villages moved to an area that did not belong to them, but where no one said something against it. Or where people from other islands settled and founded villages without permission. In times where now land gets a tradable value, these settlements may disturb the owners. This gives social tensions. You burn a few houses as a warning. The bride price is expensive but important. It is part of Sumbanese culture, but not of the immigrants as Bugis and Savunese. It depends on who feels mapped to which culture or belongs to which clan. However, it is independent of the exerted religion. Means of payment are horses, water buffalos, and pigs. Recently, cattle thefts have increased dramatically in context of the bride price. Poverty, particularly in West Sumba, forces people to steal needed livestock in Central and East Sumba. Today a good horse may be substituted by a motorcycle. Many men, who do not have sufficient resources, nowadays look for women from other islands, where their families do not expect a bride price. Vice versa, many women remain unmarried in Sumba. The bride price is not demanded by any law. An unpaid or partly paid bride price gets inherited over generations as debt. The clan elders or even sometimes lawyers watch over the debt accounts between the families. While women play a significant role in the household and while they contribute significantly to the family income by selling their agricultural products on the market, their social status is rather low. In everyday life division of labour is needed. At official occasions women have at least a say. Marriages are allowed from 14 years upwards, today they are only partially arranged by tradition and custom. Polygamy is tolerated as before, but due to the bride price only wealthy Sumbanese can afford it. In some regions women have no right to own property. Sumba horses are a status symbol. In rural areas, they are still an important means of transportation. And horses are cheaper than motorcycles. Sumbanese are excellent riders. They learn it as a child and as adults they still train whenever they can. They show their talents at equestrian events and the traditional Pasola. In town you will often see men proudly riding their horses like we do with cabriolets. On the beach they meet for evening care, horse riding, and chat. The latest trend is towards large horses, as in the rich world. Despite the efforts of numerous Christian missionaries around a third of Sumbanese lives and remains firmly in the world of Marapu. The Marapu are permanently among us and live in symbolic objects made of stone, wood, in a tree, a mountain, or in bad intension as a lightning or crocodile. In honour to the Marapu Sumbanese create images or statues with human faces into which the Marapu move in. Most of statues are standing on centrally located stone altars. There, offerings are placed. Small Marapu offerings are "Sirih Pinang". The Betel Sirih is the symbol of man, the Betel Pinang nut is that of woman, the betel leaf the connection of both and lime the earth where they grow. When these elements are chewed, they become red - that is a symbol of blood or life. Sirih Pinang is an integral part of almost all rites and ceremonies. It is also the minimum a visitor should bring a village chief as sign of respect. Great offerings are animal sacrifices such as chickens, pigs, and water buffalo. Shed blood of sacrificial animals symbolizes life, reconciliation with the Marapu and good harvest. Any type of blood that flows into the earth makes the earth fertile. Exceptions are dogs. They are no sacrificial animals, but on ritual occasions eaten for purposes of spiritual cleansing and used within families as edible gift. The Rato is the spiritual leader of the community. From the excised heart or liver of an animal or a chicken intestine, the Rato can read the fate of people, the success of the harvest, important events, etc... It allows him a glimpse into the future or reason why things happened. Such predictions are an essential part of all Marapu ceremonies. The Rato also has an important role for the birth of a child. He prays the specified list of traditional names until the umbilical cord stops bleeding. Then the name is found. This explains frequently recurring name in Marapu believers. Marapu has no specific places where adoration or worship services take place such as temples. Devotions take place there, where life takes place. This can be in a corner of the house or take place on a field or in the middle of the village. Except "holidays" which are determined by life cycles or natural events there are no special prayer times or Marapu "Sundays". Written records of the Marapu doctrine do not exist. There is no fixed liturgy. Everything is handed down from generation to generation verbally. The teachings are usually rendered by memory via holy verses. A new Rato is not necessarily a descendant of the old one. If the village community thinks that a descendant is not worthy to represent the religion, the new Rato is elected out of the community. Additionally and supportive, there is a "Ketua Adat" in each family, a representative of the custom or elders of the family. One could see him as deputy Rato. In case of election he has the best chances to become Rato. In the country the Marapu belief is still widespread, while newer religions are found mainly in the towns. 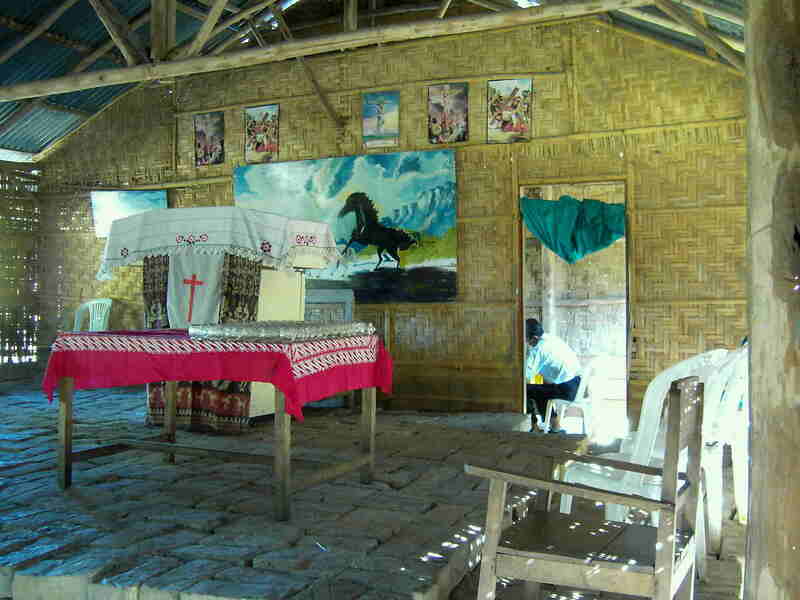 In some villages, the Rato has no longer a strong religious position today, but only a formal one within the administration. There he is a sort of a cultural representative. This again highlights the importance of Ketua Adat. Both Christian churches and the Islam abstain from any vote against the Marapu teaching. They ignore or tolerate animal sacrifices and non-Christian rites. During the Suharto era Marapu and other indigenous beliefs were ignored or even fought. Meanwhile, the policy accepts these religions. On the other side the massive proselytizing by the Christian churches is watched more critical today. If someone asks you about "your book" it is not the "Lonely Planet" but the Bible or the Koran. Ikat weaving is done mostly in Flores, Timor, and Sumba. In Sumba, it has achieved the highest development. Here it is cult as well as culture. The center of this kind of weaving is in the east and southeast of the island. For the people of Sumba Ikat is firstly a traditional garment for everyday life, but it has also ritual value as exchange object for weddings, Marapu ceremonies and as a shroud: A dead person of high status can be wrapped in many Ikat cloths. Ikat from Sumba is shown in museums of the world as an example of the highest quality of textile design. The patterns of Ikat are traditional, and represent the village where the cloth was manufactured. In West Sumba there are more geometric patterns; in East Sumba they have figural ornamentation like village scenes, animals, and mythical creatures. The figures have historical or religious significance. Unlike batik it is not dyed when it is finished, but each individual warp yarn is dyed individually before it is clamped in the loom. This is done in a bamboo frame. According to the desired patterns the threads are tied or wrapped with strings and then dyed or protected by the strings from colour. This process gives the name of Ikat = string, band. Genuine Ikat is still made with natural dyes. The blue colour comes from indigo, red colour from a mixture of bark and roots of the Mengkudu tree. The combination of red and blue makes depending on the intensity of the 2 colours, brown, purple or black. Some Ikat have additional yellow colour from the bark of the Kayu Kuning tree. After dyeing, the threads are clamped into the loom and fixed. Deviations of the frame, inaccuracies during setting, different absorbency and different strain of the threads lead to the typical slight misalignment of Ikat pattern. According to the complicated production procedure Ikat is a valuable cloth. In the past, only high-ranking clan members could afford it. Meanwhile, production has been simplified and partially mechanized. This is why really old Ikat pieces have a special collector's price. In the manufacture of Ama Tukang in Waingapu you can see a wide range of Ikat and the manufacturing process (see more under shopping). Everywhere in Sumba women are weaving. There is a wide range of woven goods. Among them there are items available that look like Ikat, but they are not made according to the original Ikat process. They are deliberately designed so, in order to look deceptively real. Welcoming: Within the family and if you have not met for a long time, you welcome each other in the traditional way by "rubbing noses" or touching noses. By touching the place of breathing, this custom symbolizes the way of human life. Doing this you have to compress visible your lips. The lower lip should be inside, the upper lip outside. With sorrow or deep sympathy you can touch the forehead in addition. For formal occasions you also welcome or thank each other with this ritual. This ritual dates originally from immigrants from Savu and has become custom in Sumba throughout the centuries. Tourists should do it in the same way as Sumba people, but the locals should take the initiative. Participation in festivities: If you have not been invited in advance, you will be asked if the people want you to take part. To refuse an invitation is impolite. People like you to get fully involved in the event. Sometimes you will be asked to dress traditionally and someone will lend you appropriate equipment. Offered food, for example of sacrificial animals, must not be rejected. As a leading figure or a foreigner you will often be given preference. Smile: Sumba languages do not know the word thank you. Everything belongs to the family or community. Take with reasonable extent, what you want. It is shown by smile if it was appropriate what you took. Body characteristics: Statements to the appearance of someone might possibly be interpreted differently to us. Here are some examples: Thick = you're alright, you take care of yourself; Thin = you feel bad, you have to work a lot; White = you do not need to work outside in the sun; ... .